Not to be confused with U.S. Cup, American Cup, or America's Cup. "Lamar Hunt Cup" redirects here. It is not to be confused with Lamar Hunt Trophy. The Lamar Hunt U.S. Open Cup, commonly known as the U.S. Open Cup (USOC), is a knock-out cup competition in American soccer. It is the oldest ongoing national soccer competition in the U.S. The 105th edition, held in 2018, was contested by 97 clubs from the two professional leagues sanctioned by the United States Soccer Federation: Major League Soccer (MLS), and the United Soccer League (USL; since renamed the USL Championship), and also amateur clubs in the earlier rounds of the tournament after qualifying through their leagues. The overall champion earns a total of $300,000 in prize money, while the runner-up receives $100,000, and the furthest-advancing team from each lower division league receives $25,000. In addition, the tournament winner qualifies for the group stage of the CONCACAF Champions League. Major League Soccer teams have dominated the competition since MLS began play in 1996. No lower division team has won the U.S. Open Cup since the Rochester Rhinos in 1999 or reached the U.S. Open Cup final since the Charleston Battery in 2008. The most recent champions of the competition, Houston Dynamo, won their first title after defeating the Philadelphia Union 3–0 in the 2018 final. The competition is a single-elimination tournament that has been contested by at least 80 teams since the 2014 edition. In 2018, this pool consisted of the 42 American clubs in the two professional leagues, which are Major League Soccer, and the league now known as the USL Championship, as well as 55 amateur teams from the Premier Development League (now USL League Two), National Premier Soccer League, the United States Adult Soccer Association, and US Club Soccer. The first three rounds, consisting of amateur and lower-league teams, are played during consecutive weekdays in May with amateur teams advancing to face USL clubs in geographical pairings in the second round. The winner of each match progresses to the next round and the loser is eliminated from the tournament. MLS clubs enter play in the fourth round, matched geographically with the winners of the third round to play on a date in June that is determined by the home side specifically selected for non-interference with league games. After the fourth round, no new teams are introduced, leading to a quarterfinal round in July, a semifinal round in August, and a final match to determine the champion in September. Every match, including the final, is a one-legged tie that lasts 90 minutes plus any additional stoppage time. If no clear winner has been determined after 90 minutes of normal time, 30 minutes of extra time is played. If the score is still level after extra time then the winner is decided by a penalty shoot-out. Through the 2011 edition, eight teams from each level of the American Soccer Pyramid took part in the competition proper, with each league narrowing its delegation separately in the spring before the competition officially began in the summer. In some cases, additional teams played in qualifying rounds to gain entry. One example was found with MLS clubs, as only the top six from the previous regular season received automatic bids, while the bottom U.S.-based MLS teams faced each other to qualify for the remaining two MLS slots. Beginning in 2012, the competition was expanded from its previous 40 teams to 64, with the qualifying process radically changed. The National Premier Soccer League received six places, plus the possibility of a seventh in a playoff against a team from the amateur US Club Soccer setup. Nine clubs from the USASA earned places, as did 16 USL Premier Development League teams. Each of these organizations has its own qualifying process to determine its entrants. These 32 teams competed in the first round of the Cup, with the winners meeting all 16 USL Pro and NASL teams in the second round. The 16 U.S.-based MLS teams entered in the third round. In 2013 the competition was expanded to 68 teams. All U.S.-based Division I, II and III teams participated in the tournament proper: 16 from Major League Soccer, six from the North American Soccer League and 12 from USL PRO. The remaining 34 spots in the tournament field were filled by amateur teams from the Adult Council category–16 from the Premier Development League, eight from U.S. Adult Soccer Association regional qualifying, eight from the National Premier Soccer League, one from US Club Soccer and one from the United States Specialty Sports Association. The process for determining the site for the Open Cup tournament semifinals and final was changed in 2013. In past years, the sites for the final three matches of the tournament had been determined through a sealed-bid process, but in 2013 the hosts of those games were determined by a coin flip. Home teams throughout the entire tournament were determined by random selection. Since 2008, the champion of the U.S. Open Cup has earned the right to play in the CONCACAF Champions League. The first team to represent the U.S. as Open Cup champion was 2007's winner, New England Revolution. Starting in 2016, lower-division professional clubs owned by higher-division professional clubs are no longer eligible to participate in the U.S. Open Cup. This removed the MLS reserve clubs in USL from the 2016 competition, after issues of clubs holding back players from their USL sides in 2015 in order to keep them eligible to play for the parent MLS club. Players are only allowed to play for one club in any US Open Cup season. Amateur clubs remain eligible to enter even if they are owned by professional clubs. Initially, "hybrid affiliate" clubs—i.e., lower-division professional clubs that are staffed but not owned by higher-division clubs—also remained eligible, but those clubs were also banned effective with the 2016 competition. This last change was proposed by the Houston Dynamo, which were the senior club to Rio Grande Valley FC Toros in the first such arrangement in the U.S. game. The competition dates back to 1913–14, when it was known as the National Challenge Cup. In 1999, U.S. Soccer honored patron, Lamar Hunt, by changing the official title of the tournament to the Lamar Hunt U.S. Open Cup. The winners of the tournament were awarded the Dewar Cup, donated by Sir Thomas Dewar for the promotion of soccer in the United States in 1912, until it was retired due to poor condition in 1979. It was brought back into use by the United States Adult Soccer Association in 1997, but is now back on permanent display at the National Soccer Hall of Fame in Oneonta, New York, and the recent winners of the tournament have been awarded a new, different trophy. Despite this, the name of each winning club is still added to the base of the original Dewar Cup. The National Challenge Cup was the first truly national cup competition in the United States, as previous cups had been effectively relegated to regional status by the difficulties in coordination and travel caused by the size of the United States in the early 1900s. While U.S. Soccer had initially administered the competition, in 1985 they handed over management to the USASA. In 1995, U.S. Soccer resumed its administration of the competition. Maccabi Los Angeles of California and Bethlehem Steel of Pennsylvania have both won the cup a record five times, while Greek American AA of New York and Seattle Sounders FC are tied for the record for most consecutive cup victories at three. The old NASL did not participate in the Open Cup. Since MLS' debut in 1996, MLS clubs have won the cup in all but one of those years. The Rochester Rhinos of the 2nd division A-League were surprise winners in 1999, defeating four MLS clubs, including the Colorado Rapids 2–0 in the championship match. The first professional team to win in the modern era were the Richmond Kickers of the USISL (the predecessor to the A-League, later known as the USL First Division, USL Pro, United Soccer League, and now as the USL Championship) in 1995, one year before the start of MLS. D.C. United were the first MLS team to win in 1996. Through the 2010 U.S. Open Cup, U.S. Soccer used sealed bids to award home matches. From 2011, U.S. Soccer uses a simple coin toss to decide which team hosts each match for most rounds. When the draw has more than two teams involved, such as the 4th round, U.S. Soccer uses a sealed envelope system. Four envelopes are opened, the first and second are home one and two followed by away one and two. This can be modified due to teams not applying to host and previous round winners not being able to be paired against each other. 3 D.C. United, New York Pancyprian-Freedoms, Stix, Baer and Fuller F.C. New Jersey 3 Elizabeth S.C. (2), Paterson F.C. ^ a b The club, now known as Sporting Kansas City, was based in Kansas City, Missouri when it won its first U.S. Open Cup title in 2004. The club did not move to its current home of Kansas City, Kansas until 2007. The following is a table of the leading career goal scorers in the U.S Open Cup during the modern professional era (1995–present). ESPN+ is the exclusive broadcaster of all matches from 2019-2022. ^ Parker, Graham (October 1, 2013). "The US Open Cup: A quiet century of soccer history". Al Jazeera America. Retrieved September 19, 2014. ^ a b "100th Edition of Lamar Hunt U.S. Open Cup Includes Increased Number of Teams and Prize Money". USsoccer.com. Chicago, Illinois: United States Soccer Federation. March 5, 2013. Retrieved October 1, 2013. ^ a b "Qualifying Format Unveiled for 2008–09 CONCACAF Champions League" (Press release). New York City: Confederation of North, Central American and Caribbean Association Football. May 14, 2008. Retrieved September 19, 2014. ^ "100 Moments: The First U.S. Open Cup Winner". USsoccer.com. Chicago, Illinois: United States Soccer Federation. May 16, 2013. ^ "Sporting KC Defeat NY Red Bulls 2–1, Win 2017 U.S. Open Cup Crown". USsoccer.com. Chicago: United States Soccer Federation. September 21, 2017. Retrieved September 23, 2017. ^ a b "2014 Lamar Hunt U.S. Open Cup Kicks Off May 7". USsoccer.com. Chicago, Illinois: United States Soccer Federation. May 24, 2014. Retrieved September 19, 2014. ^ Halaka, Josh (November 4, 2015). "MLS-owned USL teams not allowed in 2016 U.S. Open Cup, per USSF policy change". thecup.us. Retrieved November 6, 2015. ^ "U.S. Open Cup Committee Adds New Adjustment To Policy Regarding Team Eligibility" (Press release). United States Soccer Federation. March 29, 2016. ^ "USASA". USASA. Retrieved July 22, 2012. ^ Westervelt, Ted (May 13, 2013). 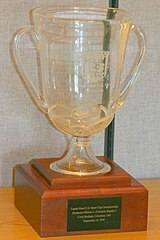 "U.S. Open Cup 1958–1987". The New York Times. Goal, The New York Times Soccer Blog. Retrieved April 29, 2014. ^ Brian Straus (October 5, 2011). "U.S. Open Cup could be revamped for '12 – SOCCER – Sporting News". Aol.sportingnews.com. Retrieved July 22, 2012. ^ Jonathan Tannenwald (March 5, 2013). "U.S. Open Cup updates format, increases prize money for 2013 edition". philly.com. Retrieved April 25, 2014. ^ US Soccer (May 24, 2018). "U.S. SOCCER UNVEILS 2018 U.S. OPEN CUP FOURTH ROUND PAIRINGS". ussoccer.com. Retrieved May 30, 2018. ^ "2014 US Open Cup Round 5: Sebastien Le Toux’s historic brace leads Philadelphia Union past New York Cosmos, 2–1 (video)", The Cup, June 25, 2014. ^ a b "US Open Cup: Title more important to Philadelphia Union's Sebastien Le Toux than scoring record", MLS Soccer, September 15, 2014. ^ a b "Philadelphia Union Reaches Semifinals of U.S. Open Cup", U.S. Soccer, July 8, 2014. ^ "2010 Lamar Hunt US Open Cup goalscoring leaders". ^ "2011 Lamar Hunt US Open Cup goalscoring leaders". ^ "2012 Lamar Hunt US Open Cup goalscoring leaders". ^ "2013 Lamar Hunt US Open Cup goalscoring leaders". ^ "2014 Lamar Hunt US Open Cup goalscoring leaders". ^ Hakala, Josh. "2015 Lamar Hunt US Open Cup statistical leaders: Goals, assists, points". thecup.us. Retrieved October 5, 2015. ^ Hakala, Josh. "2016 Lamar Hunt US Open Cup statistical leaders: Goals, assists, points". thecup.us. Retrieved June 27, 2017. ^ Hakala, Josh. "2017 Lamar Hunt US Open Cup statistical leaders | TheCup.us – Full Coverage of US Open Cup Soccer". thecup.us. Retrieved September 21, 2017. ^ Sousa, Dan. "2018 US Open Cup: Mauro Manotas of Houston Dynamo voted TheCup.us Player of the Tournament". thecup.us. Retrieved October 12, 2018. ^ "ESPN+ signs deal for exclusive U.S. Open Cup rights through 2022". Awful Announcing. April 5, 2019. Retrieved April 5, 2019.